Hair loss can occur for a variety of reasons, including illness. In fact, one of the most common causes of hair loss in both men and women is thyroid disease. According to a 2010 report published by the American Association of Clinical Endocrinologists, approximately 27 million people in the United States suffer from thyroid problems to varying degrees. The link between thyroid disease and hair loss has been clinically proven. In some cases, hair loss can be resolved through the treatment of the disease; however, some thyroid hormone replacement drugs can actually cause hair loss as a side effect. Some people with thyroid disease have some success with Rogaine® or Propecia®, but many others are confronted by the reality that their hair loss is permanent. At our clinic in New York, hair loss due to thyroid problems can be countered with hair transplant surgery of the highest quality. Offering both follicular unit transplantation and follicular unit extraction, the hair restoration experts at True & Dorin give hope to those who have lost hair due to thyroid conditions. You, too, can once again have a head full of your own healthy, growing hair, whether your hair loss was due to hypothyroidism, hyperthyroidism, or any other cause. Simply contact True & Dorin, one of the nation’s most respected and successful hair loss clinics, to schedule your initial consultation with our team. Hypothyroidism is by far the most common form of thyroid disease. Women are approximately five times more likely than men to develop the condition, especially once they enter their 60s. The condition is characterized by the insufficient production and release of certain hormones and a slower metabolism. Unfortunately, hypothyroidism can result not only in the loss of hair, but also in a dramatic decrease in the quality of remaining hair, which often becomes dry and brittle. If your hair loss has been accompanied by fatigue, joint pain, depression, or other changes in your health, it is important that you see a doctor immediately. If you are currently being treated for hypothyroidism and seeing no improvement to your hair loss, our hair restoration experts can help. Hyperthyroidism is the exact opposite of hypothyroidism; an overactive thyroid produces too much thyroxine, a hormone that, when released in excess amounts, can cause a rapid heartbeat, hyperactivity, and weight loss. Like hypothyroidism, it can also cause hair loss and is more common among women, especially young adult women. 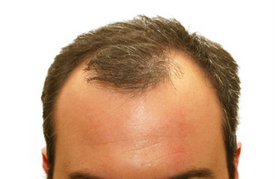 Hair transplant surgery offers a highly effective solution to hair loss caused by thyroid problems. As long as you are receiving medical treatment for your thyroid disease, your transplanted hair should be healthy and resilient. To learn more about hair loss solutions for uld be healthy and resilient. on to hair loss caused by thyroid problems. As long as you are receivingpeople with thyroid disease, whether hypothyroidism or hyperthyroidism, call or email the hair restoration surgeons at True & Dorin today.